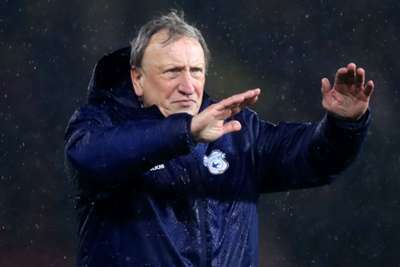 Cardiff City boss Neil Warnock says the selection of officials for his side's 3-2 Premier League defeat at Watford on Saturday was "a disgrace". Two late goals from Cardiff made a tense finish of a match Watford had totally dominated for 80 minutes, with Gerard Deulofeu, Jose Holebas and Domingos Quina sending the home side into a 3-0 lead. The deficit could, in truth, have been far greater had it not been for the heroics of Neil Etheridge in the Cardiff goal. But Warnock feels Troy Deeney should have been booked for a challenge on Etheridge and criticised the appointment of Andy Madley as referee of a Premier League game for the first time this season. Warnock's main complaint was that Andre Marriner - a more experienced top-flight referee - was on the touchline serving as fourth official. "Troy Deeney should have been booked for the challenge on our keeper," Warnock told Sky Sports. "It is an inexperienced referee in his first game in the Premier League and you have Andre Marriner sat next to me. It is a disgrace. "Why should we be an experiment? It was poor today. An experienced referee would have done something about that challenge." The City faithful show their support to @Neil38Etheridge after a fine showing at Vicarage Road. Watford head coach Javi Gracia praised the performance of Etheridge, who kept out multiple efforts by Roberto Pereyra. "The end of the game was different than the most part of it," Gracia told BBC Sport. "We dominated the first 70 minutes, we created a lot of chances and we could have got a better victory today. "Their goalkeeper was amazing. The last part of the game I think was a good lesson for us to know how we have to manage the game. "The last games we have played well, but today we deserved the win, it is important for the players and supporters. All of them deserve the victory. "We looked for a good result many games ago and now we enjoy three points."